Is Your DR Plan Better Than London Gatwick Airport’s? Then let’s say you have some form of IT failure. How do you communicate with your customers? At London’s Gatwick airport, apparently your DR plan consists of trotting out a small white board and giving a customer service agent a dry erase marker and a walkie-talkie. On the bright side, they are using black markers for on time flights and red markers for others. Gatwick is blaming Vodafone for the outage. Vodafone does contract with Gatwick for certain IT services. 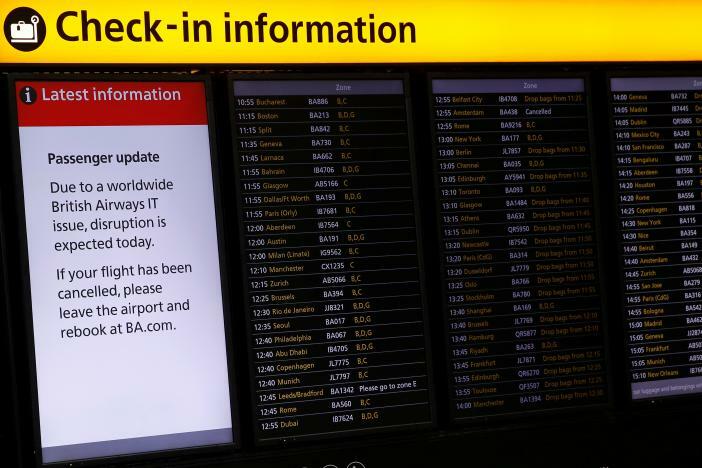 You would think that an organization as large as Gatwick would have a well planned and tested Disaster Recovery strategy, but it would appear that they don’t. Things, they say, will get back to normal as soon as possible. We have identified a damaged fibre cable which is used by Gatwick Airport to display flight information. "Our engineers are working hard to fix the cable as quickly as possible. This is a top priority for us and we are very sorry for any problems caused by this issue. But who is being blasted in social media as “absolute shambles”, “utter carnage” and “huge delays”? Not Vodafone. Passengers are snapping cell phone pictures and posting to social media with snarky comments. Are you prepared for an IT outage? First of all, there are a lot of possible failures that could happen. In this case, it was a fiber cut that somehow took everything out. Your mission, should you decide to accept it, is to identify all the possible failures. Warning, if you do a good job of brainstorming, there will be a LOT. Next you want to triage those modes. Some of them will have a common root cause or a common possible fix. Others you won’t really know what the fix is. You also want to identify the impact of each failure. 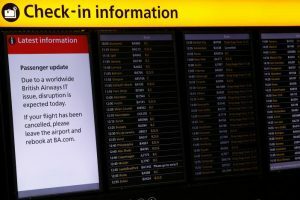 In Gatwick’s case, the failure of all of the sign boards throughout the airport, while extremely embarrassing and which will generate a lot of ridicule on social media is probably less critical than a failure of the gate management software which would basically stop planes from landing because there would not be a way to get those planes assigned to a gate. A failure of the baggage automation system would stop them from loading and unloading bags, which represents a big problem. Once you have done all that, you can decide which failures you are willing to live with and which ones are a problem. Then you can brainstorm ways to mitigate the failure. Apparently, in Gatwick’s case, rounding up a few white boards, felt tip markers and walkie talkies was considered acceptable. After the beating they took today on social media, they may be reconsidering that decision. In some cases you may want an automated disaster recovery solution; in other cases, a manual one may be acceptable and in still other ones, having an outage until it is fixed may be OK.
Time may play a factor into this answer also. For example, if the payroll system goes down but the next payroll isn’t for a week, it MAY not be a problem at all, but if payroll has to be produced today or tomorrow, it could be a big problem. All of this will be part of your business continuity and disaster recovery program. Once you have this disaster recovery and business continuity program written down, you need to create a team to run it, train them and test it. And test it. And test it. When I was a kid there was a big power failure in the northeast. There was a large teaching hospital in town that lost power, but, unfortunately, no one had trained people on how to start the generators. That meant that for several hours until they found the only guy who knew how to start the generators, nurses were manually running heart lung machines and other critical patient equipment by hand. They fixed that problem immediately after the blackout so the next time it happened, all people saw was a blink of the lights. Test. Test. Test! If this seems overwhelming, please contact us and we will be pleased to assist you. Information for this post came from Sky News. As I wrote last week, LabCorp, the mega medical lab testing company (mega as in revenue around $10 billion last year) was breached and they have provided some interesting insights as they have been forced to detail to the SEC some of what happened last week when they had to shut down large parts of their network unannounced, putting a stop to testing of lab samples, both in house and on the way. From what we are gleaning from their filings, they were hit with a ransomware attack, likely a SamSam variant which seems to have an affection for the healthcare industry. They claim that their Security Operations Center was notified, we assume automatically, when the first computer was infected. That, by itself, is pretty amazing. I bet less than one percent of U.S. companies could achieve that benchmark. Then, they say, they were able to contain the malware within 50 minutes of the first alert. That too is pretty amazing. In order to that, you have to know what you are dealing with and how it spreads. Then you have to figure out which “circuit breakers” to trip in order to contain the malware. The City of Denver was hit with a Denial of Service attack a couple of years ago and it took them, they say, a couple of hours to figure out how to disconnect from the Internet. That is more typical than what LabCorp was able to do. The attack started at around midnight, of course, when the least number of people were around to deal with it. If you factor that in to the 50 minute containment time, that is pretty impressive. However, in that very short 50 minute interval, 7,000 systems were infected including 1,900 servers. Those numbers are not so good. Of the 1,900 servers, 300 of these were production servers. That is really not so good. One of the attack vectors of SamSam is an old Microsoft Protocol called Remote Desktop protocol or RDP. RDP should never be publicly accessible and we don’t know if it was here and if used internally, it should be severely limited and where it is needed, it should require multifactor authentication. While we don’t know, it is likely that this was the attack vector and they did not have multifactor authentication turned on. Hopefully as part of their lessons learned, they will change that. Within a few days they claimed they had 90% of their systems back. It is not clear whether that is 90% of 7,000, which would be quite impressive or 90% of 300, which would be much less impressive but still good. These conclusions are based mostly on what we can interpret, since they are not saying much. This is likely because they are afraid of being sued and also what HIPAA sanctions they might get. They seem to have excellent monitoring and alerting since they were able to detect the attack very quickly. They also must have a good security operations center since they were able to identify what they were dealing with and contain it within 50 minutes. On the other end of the spectrum, the malware was able to infect 7,000 machines including some production machines. They probably need to work on this one. Assuming RDP was the infection vector, that should not have happened at all – they lose points for this one. They were able to restart a significant number of machines pretty quickly so it would appear that they have some degree of disaster recovery. On the other hand, given that they had to shut down their network and stop processing lab work, it says that their business continuity process could use some work. Finally, they claim that they were able to KNOW that none of the data was removed from the network. I would say that 99% of companies could not do that. Overall, you can compare how your company stacks up against LabCorp and figure out where you can improve. Using other company’s bad luck to learn lessons is probably the least expensive way to improve your security. I suggest that this is a great breach from which to learn lessons. Information for this post came from CSO Online. First it was Cisco; now it is Juniper and apparently there are a number of other vendors who will be affected by this flaw. While no one is saying who the vendor of the flawed hardware inside Cisco and Juniper products is, it is believed that it is Intel’s Atom C2000 chip. Intel has acknowledged problems with that chip which seem to match the description that Cisco and Juniper are saying exists in their hardware. Stay tuned. Cisco has set aside $125 million to pay for repairs for faulty equipment. Juniper and Cisco are saying that there is a flaw in a hardware clock component that is used in their switches, routers and security devices that may cause the device to crash and die starting about 18 months. The device is not rebootable and not recoverable. It is, as we geeks like to say, “bricked”. Cisco says certain models of its series 4000 Integrated Service Routers, ASA security devices, Nexus 9000 switches and other devices are affected. Juniper said that 13 models of switches, routers and other products are affected. Juniper says it is not possible to fix the devices in the field. They also said that they started using this component in January 2016, so the 18 month lifetime is rapidly approaching. They say they are working with affected customers. HP has announced that some of their products use the Intel C2000 and may be affected as well. Expect more manufacturers to make announcements as they analyze their product lines. For users, it seems like if your product is under warranty or a service contract dated as of November 16, 2016, Cisco will replace the device proactively. They say that they expect the failure rate to have limited failures at 18 months, but a more significant failure rate as it reaches the three year age range. For customers that are not under warranty or a service contract, well ……… I think you may be on your own. If you have products that use this component, you should work with your suppliers to understand the risk and figure out how to mitigate it. Information for this post came from Network World and CIO. Well, not exactly, but close. And it was not due to pictures of Kim Kardashian. When you type in the name of a website to visit, say Facebook.com, the Internet needs to translate that name into an address. That address might look like 157.240.2.35 . The software that translates those names to numbers is called DNS or Domain Name System. DNS services are provided by many different companies, but, typically, any given web site uses one of these providers. The big providers work hard to provide a robust and speedy service because to load a single web page may require many DNS lookups. One provider that a lot of big websites use is called Dyn (pronounced dine). Today Dyn was attacked by hackers. The attack technique is called a Distributed Denial of Service Attack or DDoS. DDoS is a fancy term for drowning a web site in far more traffic than it can handle until it cannot perform the tasks that customers expect it to do. In this case, customers included sites like Amazon, Paypal, Twitter, Spotify and many others. These sites were not down, it was just that customers could not get to them. The attacks started on the east coast, but added the west coast later. Here is a map that pictures where the worst of the attack was. In this picture from Downdector.com, red is bad. There were multiple attacks, both yesterday and today. The attackers would attack the site for a few hours, the attack would let up and then start over again. For the moment, the attack seems to be over, but that doesn’t mean that it won’t start back up again tomorrow, Monday or in two weeks. You may remember I wrote about the DDoS attack against Brian Krebs web site and the hosting site OVH. Those two attacks were massive – 600 gigabits per second in the Krebs attack and over 1 tb per second in the OVH attack. The attackers used zombie security cameras and DVRs and the Marai attack software to launch these two attacks. After these attacks, the attacker posted the Mirai software online for free and other attackers have downloaded it and modified it, but it still uses cameras and other Internet of Things devices that have the default factory passwords in place. As of now, we don’t know how big this attack was, but we do know that at least part of it was based on the Mirai software. And that it was large. No, HUGE. It is estimated that the network of compromised Internet of Things, just in the Mirai network, includes at least a half million devices. Earlier reports said that the number of devices participating in this attack was only a fraction of the total 500,000 – which means that the attack could get much bigger and badder. The problem with “fixing” this problem is that it means one of two things: Fixing the likely millions of compromised Internet of Things devices that are part of some compromised attack network or shutting there devices down – disconnecting them from the Internet. The first option is almost impossible. It would require a massive effort to find the owners of all these devices, contact them, remove the malware and install patches if required. ISPs don’t want to do this because it would be very expensive and they don’t have the margin to do that. The second option has potential legal problems – can the ISP disconnect those users? Some people would say that the actions of the infected devices, intentional or not, likely violates the ISP’s terms of service, so they could shut them down. However, remember, that for most users, if the camera is at their home or business, shutting down the camera would likely meaning kicking everyone at the home or business off the Internet. ISPs don’t want to do that because it will tick off customers, who might leave. Since there is no requirement for users to change the default password in order to get their cameras to work, many users don’t change them. Vendors COULD force the users to create a unique strong password when they install their IoT devices, but users forget them and that causes tech support calls, the cost of which comes out of profit. As a result of all these unpalatable choices, the problem is likely to continue into the future for quite a while. Next time, instead of Twitter going down, maybe they will attack the banking infrastructure or the power grid. The good news is that most election systems are stuck way back in the stone age and they are more likely to suffer from hanging chads than hackers. Until IoT manufacturers and owners decide to take security seriously – and I am not counting on that happening any time soon – these attacks will only get worse. So, get ready for more attacks. One thing to consider. If your firm is attacked, how does that impact your business and do you have a plan to deal with it? The thousands of web sites that were down yesterday and today were, for the most part, irrelevant collateral damage to the attacks. Next time your site could be part of the collateral damage. Are you ready? Information for this post came from Motherboard and Wired. All 12 channels France’s TV5 Monde were taken off the air one night in April 2015. 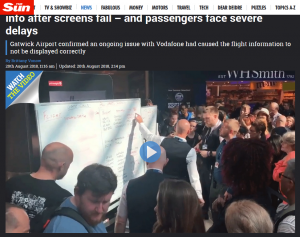 The company had just launched a new channel that day and were out celebrating when a flood of text messages told the director-general that all 12 stations had gone dark. Attackers, claimed to be from the Cyber Caliphate. Since this occurred only a few months after the Charlie Hebdo attack, it certainly could be a follow on attack from Daesh (aka isis). However, as investigations continued, another possible attacker appeared. In this particular case, as we saw in the Sony attack, the Sands Casino attack, Saudi Aramco and others, the purpose was destruction, not theft of information. They did a pretty good job of it. What was not clear was why TV5 Monde was selected for this special treatment. The attackers didn’t indicate that they had done anything wrong. The good news was that since they had just brought a new channel online that day, technicians were still at the company offices. They were able to figure out what server was in charge of the attack and unplug it. While unplugging this server stopped the attack, it didn’t bring the TV feeds back on line. Given that the goal of the attackers was to destroy and without subtlety, they destroyed software and damaged equipment. From 8:40PM that evening until 5:25 AM the next day, those 12 channels were dark. At 5:25 AM they were able to get one channel back on the air. The director-general of TV5 Monde said that had they not gotten those feeds back online, the satellite distribution customers, which is most of their revenue, might have cancelled their contracts, putting the existence of the company in jeopardy. The rest of the channels did not come back until later that day. Much later French investigators linked the attack to the Russian hacker group APT28. To this day, no one knows why TV5 Monde was targeted. One theory is that it was a test run to see how much damage they could do to an organization and TV5 Monde just happened to be the crash test dummy. The attackers had been inside TV5 Monde’s network for more than 90 days doing reconnaissance. Once they had collected enough information, they were able to construct a bespoke (custom) attack to do as much damage as possible. 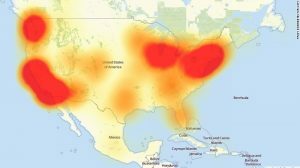 Certainly we have seen destructive attacks before, such as the ones mentioned above, but we also have seen more cyber-physical attacks such as the power blackout in Ukraine last year, the German steel mill which sustained millions of dollars of damage and the recent incursions into nuclear plants in the United States. This company survived, even though they had to spend $5 million to repair things and incur additional costs of $3 million a year forever due to new security measures put in place. The attack route, not surprisingly, was the Internet. As more and more stuff gets connected – the remote control TV cameras were controlled out the Netherlands for example – the ease of attack becomes much more of a known art. As hackers conduct test runs, such as the attack on TV5 Monde is thought to have been, they become more confident of their ability to do damage going forward. The real question is, as your company becomes more and more intertwined with the Internet, whether your organization is vulnerable to an attack – even if all you are is a distraction or collateral damage. And if you are vulnerable, will you be able to recover and survive? While the Sony attack was done as a revenge attack, we are seeing other attacks which are just targets of opportunity. The good news is that TV5 Monde survived, but they were completely disconnected from the Internet for months. Could your company survive for months without being connected to the Internet? In their case, once they were reconnected to the Internet, that conversation that many companies have – about security or convenience – became much more clear. Now it was convenience or survival and survival won. Every employee has had to permanently change the way that they operate. Forever! Information for this post came from BBC.